Posted in Agencies, News, Research, under . Tagged with education agencies, global language learning, IALC, Student Marketing, Study Travel. "What's exciting in these results is the trend towards studying a language other than English"
This is actually a tiny proportion of the language learners globally – estimated to be 0.25% of all those studying a second language around the world. English is unsurprisingly the most in demand language among study travel students, but the overseas market share still only represents between 0.3% and 0.9% of all English language learners in the world, according to Samuel Vetrak of StudentMarketing, who presented the latest research findings at the IALC conference in the UK this week. 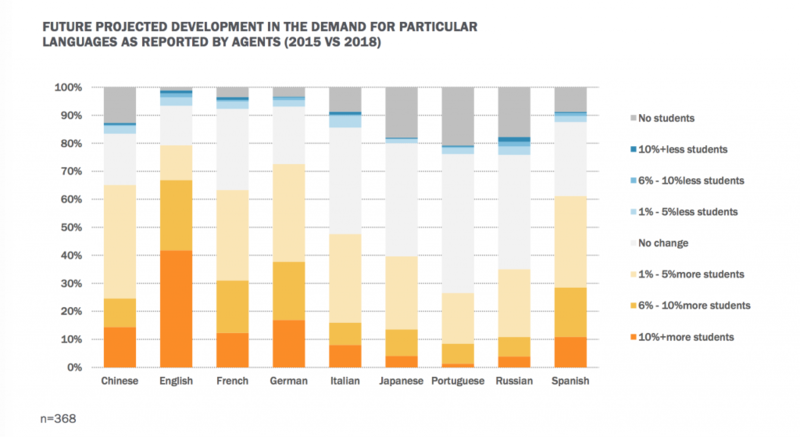 Further growth in demand for language study stays overseas was predicted for all markets, but English, German and Chinese language provision has the best growth prospects, according to further data based around an extensive survey of education agencies that StudentMarketing undertook. The research revealed that of the 466 education agencies that participated in the survey (sending an average of 526 students per year to study overseas), those promoting multiple languages were “not concerned about their business outlook”, related Vetrak. This signalled a business opportunity, he argued, for agencies to consider working with new language options. Of those agencies surveyed, only just under 30% were currently representing Chinese language schools, for example. Vetrak also counselled that for many language learners studying a language beyond English, it was often the student’s third language and therefore they were more sophisticated, experienced study abroad customers. Booking channels beyond agencies were more likely to be considered by these savvier students, he added. The survey also provided a snapshot on the business mood of agencies in general, with the majority of agencies reporting a decline in business for 2015 coming from Russia. Agencies in India, Mexico, Vietnam, China, Colombia and Argentina were most likely to have cited good growth in 2015. Of the languages not listed but cited in the survey as generating some demand among customers, most typical was Arabic followed by Korean and Turkish. Jan Capper, executive director of IALC, told The PIE News that the association commissioned the report because of a lack of business data in the study travel industry.